So what is an iPod, exactly? An iPod is a portable media player capable of playing digital entertainment in the form of music, movies, applications, games, podcasts and more. iPod devices come in many shapes. From pocket-size to handheld, iPods give you portable entertainment for just about any need. One of the most popular iPod devices is the iPod classic. This model is small enough to slip into your pocket but takes up a good portion of the palm of your hand, as it measures about four inches in length. It holds up to 160 GB of storage, or about 40,000 songs, depending on the size and file type. If you have several GB of music and you want to keep it somewhere besides your computer, an iPod classic is an ideal backup option. It does little more than play music, podcasts, photos and video, but if that’s all you need, it’s a perfect choice. What is an iPod nano? An iPod nano is basically a miniaturized version of the iPod classic, but you can also play built-in games, listen to and pause live radio and shake to shuffle when you want a new song. The nano no longer has a click wheel but offers touch commands only. 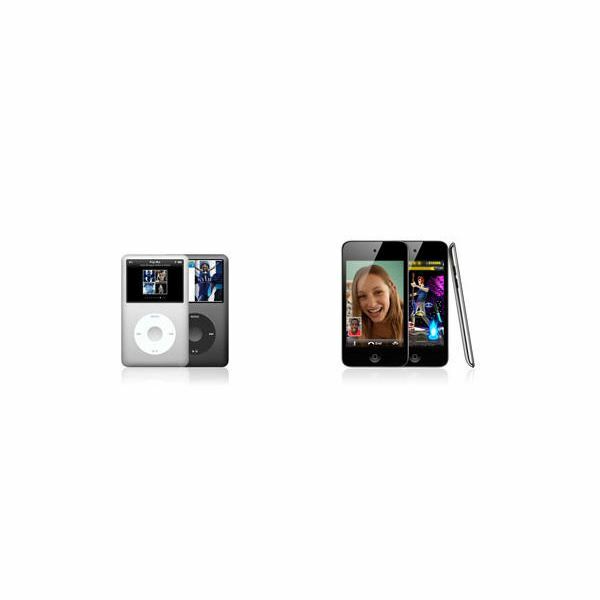 The iPod nano has significantly less storage capacity than the iPod classic, as it comes in 8 GB or 16 GB models. But it’s one-quarter of the iPod classic’s size and is less expensive, so you don’t have to cart around a huge gadget all the time just to listen to music. If listening to music and podcasts are your only needs, then get yourself an iPod shuffle. It’s the same size as an iPod nano, but at less than $50, it fits into most buyers’ tight budgets. The iPod shuffle boasts 2 GB of space for songs, audiobooks and podcasts. It also comes with the capability to change songs via voice command. For those who don’t wish to get an expensive iPhone with an even pricier monthly plan, the iPod touch is the perfect, contract-free alternative. What is an iPod touch? An iPod touch is a touch-command device with a 3.5-inch diagonal retina HD screen display. For those who want the ultimate in gaming, application, multitasking and on-the-go entertainment experience, the iPod touch is the model of choice. The iPod touch is the only non-contract iPod device with wireless capability, too. Hook into your own home wireless network, or link up with the free Wifi at a hotel or Wifi hotspot. You can create an iTunes account on the computer and download new games, music, movies and applications from your device without the use of a computer. An iPod touch comes in 8, 32 and 64 GB models. If you don’t have a lot of music and you merely want to play games, the 8 GB model is ideal. But if you own thousands of songs and plan to do a lot of gaming, get one of the higher-capacity models so your device doesn’t get sluggish.